Want to know the best way to come out on top of virtually any argument? 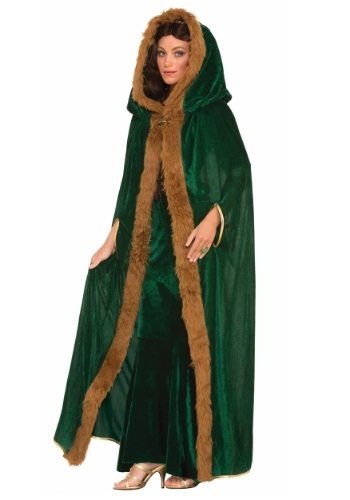 Just make sure that you go into it wearing a full-body, fur-lined, hooded cape. Now, that may sound like an unorthodox approach, and it’s probably not sanctioned by any of your finer debate clubs, but it really works. Let’s say you’re in a crowded room and you only have ten seconds to pick out the wisest person in the place. Are you telling us you’re going to glance around the room and settle on one of the folks who isn’t wearing a full-body, hooded cape? No, you’re going with the person who looks like she just left a secret meeting with someone named something like Whitebeard the All-Knowing. That look is pretty much the definition of wisdom, or at least incredible self-confidence. Sometimes that’s just as good. Even if you happen to run up against someone who doubts the wisdom of the cape, you have a few excellent fallbacks at your disposal. If you feel yourself starting to lose the argument, simply pull that hood tightly over your head and declare loudly, “I’m sorry, I can’t hear you over the awesomeness of this hooded cape!” And if even that strategy fails, just wrap the cape around yourself and tune the chatter out as you fall to sleep. That’s a definite advantage to walking around in what’s essentially a big blanket. Show the world you have the wisdom of the realm in this cozy polyester velvet cape, featuring brown faux fur trim around the hood and front edges, gold lame edging at the wrists, and a brass-tone lobster claw clasp at the neck. It’s a versatile piece suited to any number of costume concepts, from Ren Fests to Middle Earth elves to the Ghost of Christmas Present. Whoever you choose to be, you’re going to look like the wisest there ever was. I got this so I can look like lady stark and I think it did the job pretty well!